What could be better than ocean water and relaxing, invigorating, massaging treatments by expert hands? The Charente-Maritime Thalasso Experience, your first stop for water health therapies with its six thalassotherapy centres, could well become a ritual you stick to. The setting: the six centres are located on Île de Ré and Île de d’Oléron, in the centre of Royan and to the south of La Rochelle, with the ocean close by and often visible from your room. There’s a beautiful, soothing view of the open ocean. The ocean leaves you calm and revitalised. The treatments: for a spot of pampering, you have the classics, like sea water body massage, seaweed wraps and hydro-massage, as well as treatments that follow the latest trends or have an exotic twist. As if that weren’t enough, the centres offer top-quality facilities such as elegant, zen-like rooms; spas with saunas, steam rooms and Jacuzzis; and excellent dining. They’ve got it all! The relaxation: take your time, rest, read 300 pages of your book in one go… Finally, well-being starts here. It’s total disconnection, and you feel like the strain of daily life has been lifted – to put it simply, you just feel good. You can also leave the centre for a few hours to satisfy an urge to shop or for long walks along the beach. Côté Thalasso Île de Ré, in Ars-en-Ré, is the perfect spot for lovers of calm and nature. From wild beaches to the Baleines Lighthouse, from vineyards to salt marches, you’ll get a taste of the laid-back life on Île de Ré in an unspoilt setting filled with the simple pleasures of a 100% relaxing thalasso stay. Whether you choose a course of treatments, a mini break or a one-off treatment, feel reinvigorated and enjoy all the physical benefits of the sea at the Côté Thalasso thalassotherapy centre. Facing out to sea and in the heart of the vineyards, the Relais Thalasso Île de Ré is located in the midst of nature on a five-hectare reserve in Sainte-Marie-de-Ré. In this dreamy setting, which offers direct access to the sea, osteopaths, hydro-therapists and relaxation therapists watch over your well-being. You can also pick and choose the sea-based, aesthetic and massage treatments you want! The thalassotherapy centre at Châtelaillon-Plage has just been transformed into an incredible sea spa! Part of the Ibis Styles Hotel, it offers 2,700 square metres of space dedicated to treatments, well-being and relaxation. Everything’s been thought of to immerse you in a haven of peace, comfort and sophistication. As for the new Spa Nuxe at the MGallery Sofitel Hotel La Grande Terrasse, it’ll provide well-being and zen-like calm in a luxurious setting with the sea as its focal point. 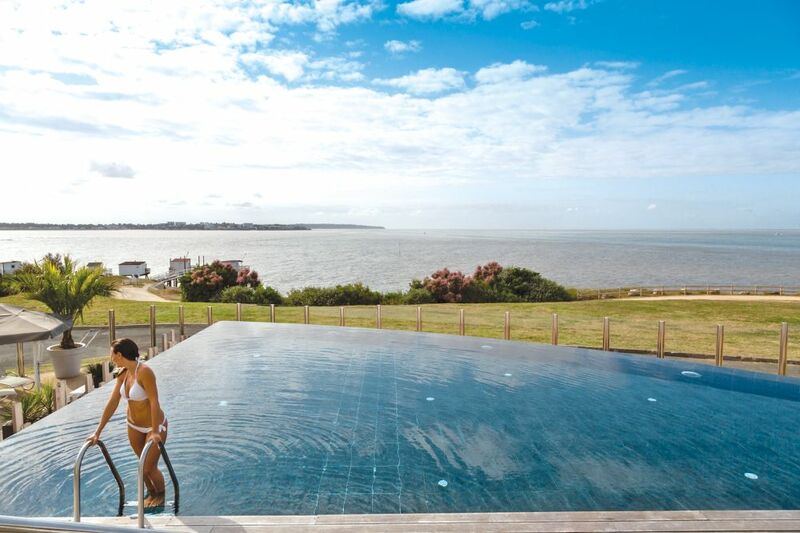 At the southernmost point of the island, the Novotel Thalassa Sea and Spa Hotel Île d’Oléron is ideally located in a sunny, sheltered spot. All around, a mixed forest envelops it in tranquillity. Opposite, the pretty Gatseau beach stretches for 14 unspoilt kilometres. Enjoy unhindered light while looking out to sea. Its staff members will do all they can to make each minute a moment of relaxation. Whether they have a sea or forest view, all of its spacious rooms boast a balcony and are decorated in peaceful wood and sand tones. In 2018, the centre unveiled a new look, with design inspired by the sea, new spaces, show cooking and more. In Royan, facing out to the Atlantic, this light-filled, friendly centre offers high-quality treatments with a human touch. Make a date with their nutritionists, physiotherapists, hydro-therapists and beauty technicians for your mini break or day of personalised thalassotherapy treatment. In a relaxing, natural setting, rest and well-being are guaranteed, and cutting-edge facilities await.